Test fuel for ethanol to protect engines from contaminated E10 gasoline. + Ethanol Alcohol Fuel Test Kits (AFTK) to protect engines from unnecessary alcohol-caused damage. 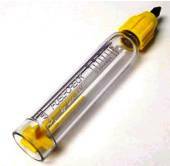 Fuel-Tester, squirt tip dispenser bottle, rubber stopper, tester stand and more. (Image: Deluxe Kit -Product Code: AFTK-D). Blue Quik-Check drop(s) settles to bottom, not absorbed. Left: Quik-Check reveals gas contaminated with alcohol and water (bright blue). Alcohol is expected to attract and absorb water. Oil + water do NOT mix. Gas additives/stabilizers will NOT remove water from a sedentary fuel tank. Request: E10 Gas Storage Tips. Scroll down page for more valuable ethanol information. 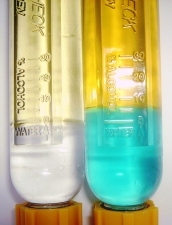 Right: Test tube results (6% alcohol in gas) - Quik-Check Solution turns alcohol & water bright turquoise blue. Left: Fuel-Tester results reveal no (0%) alcohol. Therefore if your engine is not a FFV, most likely E15 gas is NOT approved for use and will invalidate your warranty. * Note: Based on test reports we receive E15 gas type with excess ethanol of 15% and higher is being (illegally) sold in all states. 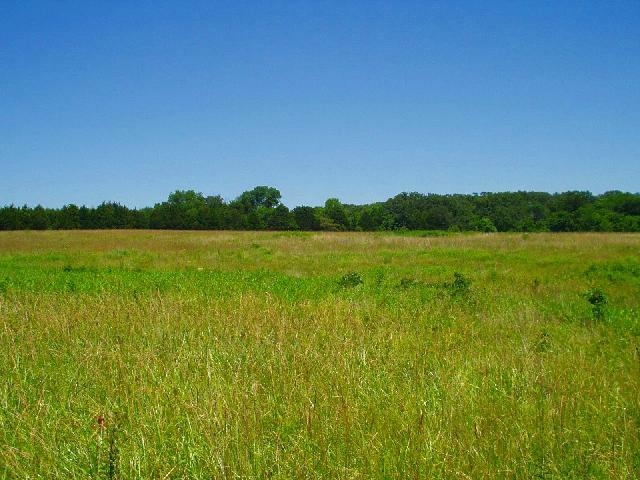 - The EPA issued a plan to mitigate engine damage from E15 mis-fueling...More E15 information. Request Fuel-Testers Company e-NEWS newsletter for more details and updates . Can I safely use E10 type gas in all my engines? Most modern engines are designed to run on ethanol blends up to 10% alcohol. Many older engines (pre-2003) issued warnings against use of gas with ethanol, and parts may not be designed to resist solvent effects of alcohol. For prolonged gas storage, it is always safest to leave gas tank empty, when ethanol-free gas is unavailable. E10 gas will only remain stable (water-free) for a maximum of 3 months, when stored under ideal low humidity conditions. ---> Always check product ingredients before use with E10 fuel type. Most gas additives contain strong solvents, cleansers and/or alcohol, which is contraindicated for use with E10 gas type. Important: No gas additive can prevent ethanol's natural ability to attract/absorb or remove water in a sedentary engine. Products such as Stabil, only "perk-up" stale fuel by increasing energy content; They do NOT prevent or remove water from gas tank. Ethanol is a strong solvent/cleanser and drying agent that will wear down engine parts. Since ethanol rapidly attracts/absorbs water into gas, shelf life is less than 3 months. * #1 Reason for gas-caused engine damage=Phase-separated and/or water-contaminated E10 gasoline. Now the lower layer of tank contains an alcohol concentration of 60 to 95%! * Details 10 Gasoline PHASE SEPARATION: Alcohols attract and absorb water...Oil and water do not mix. Although gas with ethanol may cause varied problems/issues, the #1 reason most engines experience major damage is solely due to running phase-separated fuel, which now has a much higher alcohol concentration at the bottom of the tank + a drop in octane of 2-3 points in the upper tank layer. 10% is the maximum amount of ethanol allowed by all conventional engine manufacturers and warranties. Gas with excess ethanol will absorb MORE WATER, MUCH FASTER. Warning: E15 (15%) is now being legally sold, but ALL engine manufacturers prohibit use of this new fuel! *Not applicable to FFV's/E85. from those who design, sell and repair engines. Following simple precautions will decrease risk and help safely manage E10 fuel blends. E10 gas can cause engine damage, poor performance, parts deterioration and lower mpg. Many gas stations do NOT label gas pump when ethanol is added. Is the EPA protecting you or the ethanol lobbyists? BUYER BEWARE: Over 95% of gasoline sold at public gas pumps now contains ethanol=E10. Finding ethanol-free pure gas is challenging and almost impossible in many areas of the U.S.
For years over-blending of E10 has occurred is due to carelessness (lack of oversight) and profit motives, encouraged by government tax credits and subsidies. Now that E15 (50% more ethanol) is being sold, intentional over-blending and misfueling may only get worse. Reclaim your right to choose ethanol-free pure gasoline. Sign Petition to assure fuel choice at gas pumps, including non-ethanol gasoline.